US poet, Professor of Modern Languages and Literature at Harvard for nearly 18 years. His narrative skill made him one of the most popular poets of his day. His best-known poems include Evangeline (1847), Hiawatha (1855) and Tales of a Wayside Inn (1863). Evangeline: A Tale of Acadie (1847), Part II, Section II. Sail forth into the sea of life, O gentle, loving, trusting wife, And safe from all adversity Upon the bosom of that sea Thy comings and thy goings be! For gentleness and love and trust Prevail o'er angry wave and gust; And in the wreck of noble lives Something immortal still survives.  Henry Wadsworth Longfellow, Kavanagh: A Tale (1849), Chapter XXI. 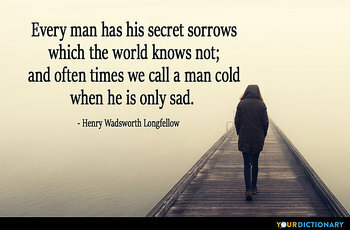  Henry Wadsworth Longfellow, Tales of a Wayside Inn, The Student's Tale, Part I.  The Belfry of Bruges, Stanza 9.